The Anchorage School District is trying to decide if 6th graders should be placed in elementary or middle schools. Currently there are some in each. District staff have been weighing the options for more than a year because it impacts future school infrastructure upgrades. They’re also looking at what’s best for the students academically. Sixth grader Janera Faaaliga enters the deafening lunchroom at Begich Middle School and sits down with her friends. “So you’re all in 6th grade?” I ask the crowd of girls as they finished their pizza and peaches. “Yeah,” they say, almost in unison. “Why?” I ask, trying to prompt somewhat longer answers. 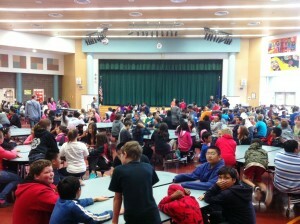 Students eat lunch at Begich Middle School. Lockers are resoundingly the best thing about middle school according to this group and many others. Faaaliga says she wished they had them in elementary school, too. Seventh grader Leola Atkinson agrees–she loves the privacy of middle school and the chance to meet more people. She says she survived learning to open her locker and move between classes. Begich Middle School Principal Brian Singleton agrees. He says middle school is developmentally more appropriate for most sixth graders. Singleton, who used to work at Government Hill Elementary, says some sixth graders are physically much larger, too, making them look out of place in elementary schools. He says the transition from elementary to middle school is hard for kids who enter both in 6th and 7th grades. “It’s the differences and the change that seem to be more significant rather than how they respond to it based on their age.” But he says giving families options to keep the kids in elementary or move them up is a positive thing. A 2007 study from Duke University shows that kids who stay in elementary school for 6th grade do better academically and have fewer discipline problems. The effects last through 9th grade. The researchers think it’s because impressionable sixth graders in the middle schools were mixed together with older adolescents who are more rebellious. ASD Chief Academic Officer Michael Graham says he was surprised at the national data, but that’s not the only thing the district will consider when making the decision. He says they are also conducting local research, considering the financial impacts of changing the system, and asking community members to weigh in on the questions. Some 6th graders at Lake Otis Elementary, like Tommy Lee, say they think staying in elementary school is a mixed bag. Sixth grader Jesslyn Sene says she’s not sure if she would have been ready for the responsibilities of being a school role model last year, but she likes it now. Nevertheless, Sene says she would have rather joined Janera Faaaliga in the middle school hallway. Faaaliga dodges her classmates on her way to her coveted locker. “Here, I’m gonna show you how to open my locker.” She quickly flips open the combination lock like a pro. The tall, grey-blue box is pretty empty. “So… you’re not going to decorate your locker or anything?” I ask. 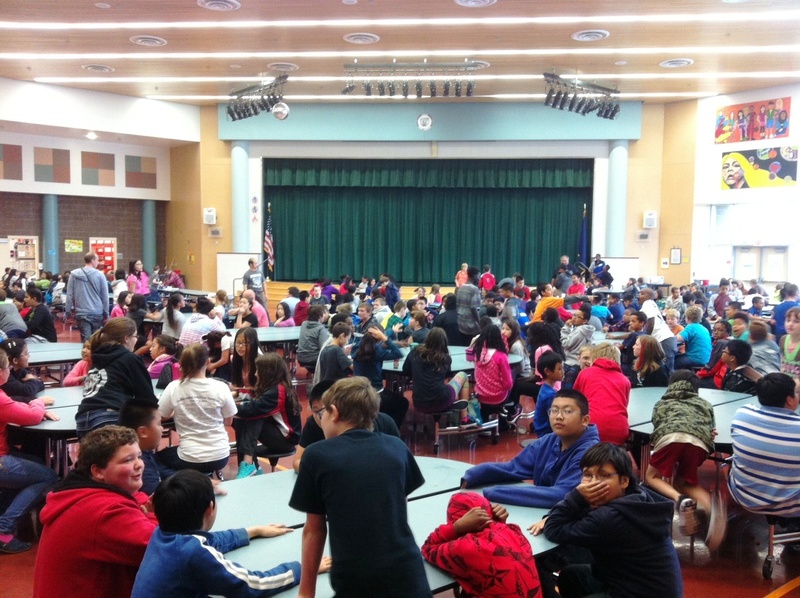 The school board plans to decide the future of Anchorage’s 6th graders by the end of October. They’ll present local data on the 6th grade question during three community meetings this week.